You’re reading this article right now, because you’re looking for help. At least that’s my assumption anyway. You’ve got a goal in mind that you’re working towards, maybe a holiday, a wedding, or perhaps you’ve always wanted that shredded look. And despite your best intentions and hard effort, you look in the mirror and see pretty much no change. At his point you just can’t figure out what’s gone wrong. In fact it’s just downright frustrating and confusing. Because you followed the ‘8 week ab ripper’ programme from your favourite magazine to the letter. No doubt you want answers, because at the moment you feel lost and are on the verge of giving up. Not giving yourself enough time to achieve sustainable fat loss. Focus on high rep, high volume exercises. Filling your training routine with hours and hours of cardio every week. Eating ‘clean’ but not tracking calories. Placing misguided faith in worthless fat burning supplements. Regrettably, these common mistakes are ones that I see all the time. Ultimately, on face value they look like the right things to be doing. And some of them have been long-standing aspects of a traditional approach to fitness. But the truth is that they aren’t the most effective way to get you to your goal. If you really want to get abs fast, you need to change your thinking. 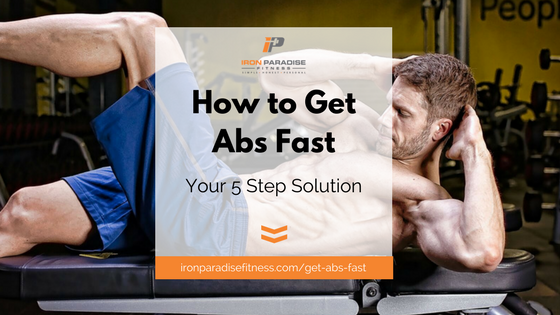 So here are the Iron Paradise Fitness 5 rules to get abs fast. Let’s start off right back at square one. When I talk about how to get abs fast I probably have a different definition to everyone else. And what do I mean by that? Well, the fact of the matter is that getting a shredded physique takes 2 things. Time and Consistency. The summer six pack will remain elusive without these two things in place, that’s a fact. Because there really is no quick fix or magic solution (sorry to disappoint). No doubt reading that gives you a bit of a dejected feeling. You probably thought that I was going to recommend a revolutionary new supplement that just melts the fat away. But, in all honesty, those things just don’t exist. And if they did, I’d be first in line and loading up my car! First and foremost you need to allow enough time to shred that fat and get that six pack. Because leaving yourself a couple of weeks to lose 5 / 6 / 7% body fat is going to lead to failure. It’s not a realistic goal. And you’d have to almost starve yourself to get there. And even if you did that, I’m not sure you could shift that much fat in time. So the answer is to plan ahead and allow yourself enough time to lose the fat. For example, it took me around 16 weeks to cut from around 16% body fat to 6%. And that’s with doing everything right day in day out (we’ll come on to that next). It might sound counterintuitive, but giving yourself more time is actually the going to get you results faster! As a matter of fact, trying to crash diet is probably the worst thing you can do. In all likelihood it’ll send your metabolism through the floor while at the same time leaving you miserable. The consequence of which is slow and protracted fat loss, which is definitely not what you want. Second of all, whatever timeframe you give yourself to get lean, you’ll need to be consistent. All too often I see and hear of people that have the best intentions for a couple of weeks, but fall off the wagon by week 4 or 5. Be under no illusion, getting to single figure body fat percentages (slightly higher for women) is tough. Because if it was easy then we’d all be walking around with washboard stomachs all year. Therefore, you have to stick with your training and nutrition day in day out, week after week. Because it’s that consistency that breeds results. Establish a clear goal before you start and make the goal public. This helps increase accountability. Set a clear plan for training and nutrition. Understanding what you need to train each day and having macros mapped out removes guesswork and deviation. Understand your why. Why do you want to achieve your goal? Write it down and keep it visible. Because it’ll serve as a good reminder when it gets tough. Become self-aware and get to know your habits. Because understanding your bad habits will help you change them for better ones. It might seem strange that I’m recommending you lift heavy with the goal of fat loss in mind. And even though it’s a long-standing view that lifting heavy is for your bulking stage and not for shredding, the evidence tells a different story. Work in the 1-6 rep range for strength, 6-12 for hypertrophy (muscle development), and 12-15 when you’re dieting or aiming to increase endurance. And it’s the last part of that sentence we’re most interested in, because in my view it’s outdated. First of all we need to look deeper into what you’re trying to achieve. You want to lose fat and get abs fast, right? Well to do that you need to maximise your opportunities to burn fat throughout the day, which means raising metabolism. So where does heavy lifting fit into all this? Therefore, the more lean muscle you have the more calories / fat you’ll be burning throughout the day. And this becomes even more important the older you get as your metabolism will begin to slow down. So the takeaway here is to not give up that strength training the minute you start that summer shred. The ideal rep range to work in is still 4-6 for your compound lifts, with slightly higher reps for any isolation exercises. And if you need a bit of back up science to that theory, then check out this study. When you look at the study you can see it shows the effect of low–moderate volume, high intensity training vs traditional high volume, lower intensity training. The group working in the lower rep range increased both strength and muscle significantly compared to the higher rep range group. This was determined to be as a result of higher amounts of mechanical stress (as opposed to the metabolic stress of the higher rep range group) of training with heavier weights. Additionally, training with heavier weights stimulated more of the participants Type II muscle fibres, leading to greater adaptation and muscle growth. So train heavy to build more lean muscle and maximise the calorie burn! It’s got to be one of the most well-known cliches that “abs are made in the kitchen”. But is it true? Well the simple answer is yes. Of course you need a number of other components to be in place as well, but fail to get your nutrition right and it could all be a waste of time. The bottom line is you won’t be able to ‘get abs fast’ if you’re not in a calorie deficit. So your diet needs to be set up correctly from day one to avoid another disappointment when it comes time to slap that sun tan lotion on in a few months time. Essentially progress can hinge on this fundamental part of your programme. Ultimately, the guiding principle to remember is energy balance. Calories in vs Calories out is what really matters. After all, if you’re not in a calorie deficit (consuming less calories than your body needs) you won’t lose weight. It’s simple maths. Unsure how to work out how many calories you need? If you want to learn how to build the perfect diet plan, here’s how. You can register for my FREE ‘7 Steps to Get Lean’ online workshop by clicking on the image below. During the workshop I’ll be there to explain everything from start to finish, including everything from calories to macros, meal timing, and supplementation. The workshop will guide you through a simple 7 step process to help you get everything mapped out. So there’s no need for guesswork and frustration. You’ll be able to get started pretty much straight away. Once you have the calories you need worked out, next up is your macro breakdown. And people often get even more confused, lost, and give up figuring it all out at this point. But it needn’t be that way. Even though the fitness industry has a propensity to make things mind bogglingly complicated, it’s actually quite simple. 0.8 – 1.2g of protein per pound of weight (multiply the number you get by 4 to get the calories you need from protein). 0.3 – 0.5g of fat per pound of weight (multiply the number you get by 9 to get the calories you need from protein). Put all remaining calories to carbohydrate. Then it’s just a case of turning the numbers into food and you’re on the right path to success. So we already established in Rule #2 that weight training and maintaining / building muscle is highly beneficial for weight loss, but what about cardio? By and large, gym goers all over the world gravitate to the treadmill when it comes to shredding. When it comes to those few months before the summer holiday there’s a sudden deluge of cardio sessions that fill up training programmes. And it’s not just a bit of cardio and there. What I’m talking about is hour after hour of it. But is this burning as much fat as you might think? On the contrary I’m afraid. Unfortunately, those hours of sweat-drenched LISS (Low Intensity Steady State) cardio aren’t maximising your time or your fat loss. Allow me to explain. Earlier in the article we covered that fact that building more lean muscle is better for fat loss than cardio alone. However, cardio does have it’s place in your programme, just not in the way you might have traditionally thought. If the result you want is fat loss in the shortest time (and who doesn’t) then you need to focus on HIIT (High Intensity Interval Training) cardio. Bodybuilding tradition would have you believe that LISS is the best form of cardio for those wanting to preserve lean muscle. But the fact is that there are countless studies that show HIIT to be of greater benefit when it comes to fat loss and if done at a moderate level will not impact or erode lean muscle tissue. This study analysed the effect of HIIT vs LISS using 27 men and women over a 15 week and 20 week period respectively. The group adopting the HIIT approach burned less than half the calories of the LISS group, yet saw much greater fat loss. HIIT is the better version of cardio for fat loss and improving overall health. The answer to that is straight-forward. Do enough cardio to achieve your overall goal. Luckily, following a HIIT approach will mean that you don’t need to train for as long to get the effect you need. I recommend that people start with 60-90 mins of cardio per week if they are on a fat loss programme. This is manageable in 3 separate sessions and won’t leave you dreading the very sight of a piece of cardio equipment. What cardio exercise should you do? Again the answer is pretty simple. Do what you enjoy and do what gets results. My first choice is always the exercise bike. Perhaps that comes from being a cyclist, but I prefer the low impact nature of the exercise and I find I can do the hard efforts without pounding on my joints and muscles. However, the elliptical trainer, rowing machine, etc are all good options. And for a lot of people just getting on a piece of cardio equipment is the biggest struggle. So try different pieces of equipment out and find what works for you. Fasted cardio is a topic I covered extensively in another article, which you can read here. But for now, here’s the key extract for this blog. “The majority of the research shows that there’s no material benefit in fasted cardio over fed cardio. Overwhelmingly, it will be being in a calorie deficit and getting your cardio done that makes the biggest difference. Contrary to long-standing beliefs, you don’t have to do fasted cardio to get results. So if you can’t stand the thought of dragging yourself out of bed to train. Then don’t. Leave the alarm clock switched off and hit the treadmill later on. When it comes to supplementation, I like to keep things as brief as possible. And the reason for that is simple. I don’t want you to get distracted by supplementation, because it is never the answer. If you follow rules 1 – 4 of this article you’ll get 99% of the way there to your shredded look. In reality, most fat burners are like the chocolate fireguard of the nutrition world. Useless on every conceivable level! While there is the odd reputable company offering high quality products, these are still only going to give you support with that last little bit of stubborn fat. And if you still want to find out more then the ‘7 Steps to Get Lean’ workshop workshop covers all you need to know and what supplements are worthwhile taking. So register for free now. In summary, the bottom line on all this is that there is no miracle solution and no quick fix. Essentially, it comes down to Time & Consistent application of the right methods. If you have this winning formula nailed, then that summer six pack will be yours. Oh, and you might have been left thinking about ab exercises. Don’t worry I haven’t forgotten. In all honesty, if you have the right training in place then a billion ab crunches aren’t needed. The fact of the matter is that you can’t spot reduce fat. And by that I mean just doing ab crunch after ab crunch doesn’t shift fat from your abs. Sadly, it doesn’t work like that. At the end of the day, focus on above steps as your main rout to the #shredlife. But for those of you desperate to know the best ab exercises then here’s 3 of my favourites. Do these as a circuit one after the other with 1 minute rest between each circuit. For the best results, incorporate that circuit 3 times a week with 3 circuits per workout. So there you have it. I hope you found the article useful and you’re now well on your way to get abs fast!